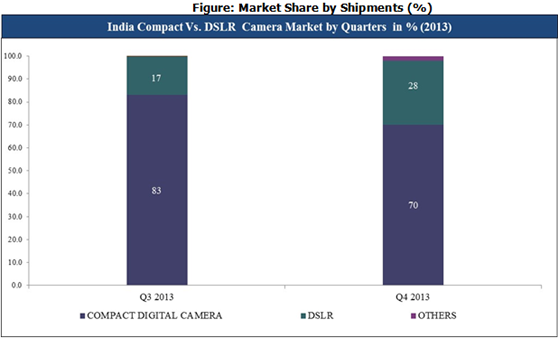 India Digital Camera Market registered a Total Unit Shipments of 0.6 Million units in CY Q4 2013. The Compact Digital Camera segment registered a decline of 17% in terms of unit shipments. Whereas, DLSR range of cameras exhibited an eye popping growth of 59% compared to the previous quarter, which can be well explained by the increased usage of cameras in smart phones. Note: Others include SLR, Digital still SLR, Compact SLR, Semi DSLR, ILC and Mega Zoom Digital Camera. The market share for HDMI featured cameras exhibited a slight increase from 72% in CY Q3 2013 to 73% in CY Q4 2013. Further, cameras with USB 3.0 and GPS features experienced 1% growth in market share over the previous quarter. Top three player’s holds 95% of the total market share. 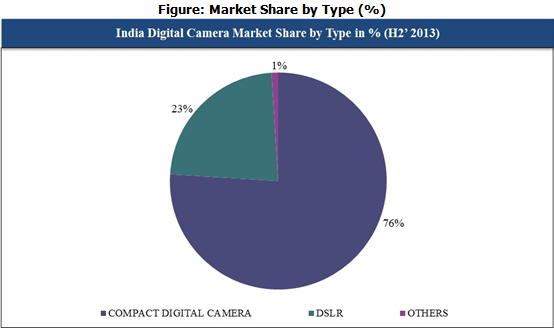 Out of the total shipments, 16 Megapixel Digital Cameras captured more than 31% of the market. Micro SD card feature represents 30% of the total market share. CMOS Image Sensor captured 42% of the total market share in terms of unit shipments followed by 29% of CCD and 14% of Exmor CMOS sensor, whereas in Lens segment Nikkor lens leads the market with a share of 27%.